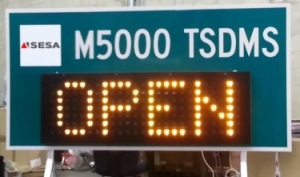 SES America has announced the addition of its M5000 Task-Specific Dynamic Message Sign (DMS) to the Florida Department of Transportation (FDoT)’s approved product list. The addition of the M5000 TS-DMS to the list is a continuation of SES America’s commitment to bring its full product line of industry-leading energy-efficient DMS to the state of Florida. The M5000 TS-DMS features low-power consumption display boards, outfitted with high-intensity LEDs, housed in a NEMA TS-4 rated DMS housing. The M5000 is designed to be installed within static highway signs, making it perfect for applications such as toll rates and lane status messaging. The M5000 TS-DMS joins a short list of embedded DMS on sale in Florida, which have been approved by the FDoT. Known nationwide for its stringent quality standards, districts in Florida must adhere to the FDoT approved products list for all traffic control device purchasing decisions. SESA is committed to maintaining the quality and performance requirements set forth by the FDoT’s traffic research engineering lab throughout its entire product line. All DMS manufactured by SESA comply with the latest version of the national transportation communications for ITS protocol (NTCIP), which allows them to connect seamlessly with existing NTCIP-compliant intelligent transportation systems.